, Friday from 8:00 a.m. to 7:00 p.m.
, Saturday from 8:00 a.m. to 5:30 p.m.
Our commitment to you is 100% satisfaction on all your floral and gift purchases. If you are not completely satisfied, let us know by calling (920)436-6363. 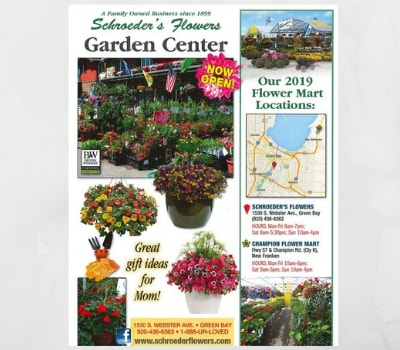 If you have any questions or need more information, please contact us directly at orders@schroedersflowers.com or (888)UR-LOVED. We're always here to serve you and make your flower-sending experience a pleasure. LOCAL ORDERS will be delivered same day if received by 2pm. U.S. WIRE orders must be received before 12:00 noon in the recipient's time zone to assure same-day delivery. Orders received after that time will be delivered the following day. We will do our best to accommodate deliveries at specific times of day, but we cannot guarantee it. We are unable to make deliveries on Sundays except for Funeral orders. All other deliveries requested on this day will be delivered the following business day.